Could Mike Trout leave Angels after 2020 season? With two-way rookie phenom Shohei Ohtani reportedly in need of Tommy John surgery and expected to be out until 2020, talk of the Los Angeles Angels' long-term future now shifts back to a familiar target: Mike Trout. The superstar outfielder is in the midst of another MVP-caliber season. And his team again appears both on the fringe of contention and the fringe of falling out of the postseason race. And the absence of Ohtani certainly indicates the team is closer to the latter. The Angels are 37-29 and in third place in the tough AL West -- 5 1/2 games back in the division and Wild Card standings. 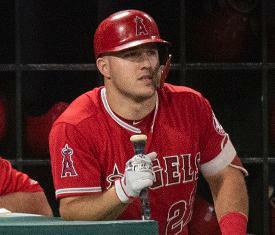 With Trout's contract set to expire following the 2020 season, the Los Angeles Times' Bill Shaikin recently asked the outfielder, as well as Angels general manager Billy Eppler, the likelihood Trout would sign an extension with the Angels before hitting the free-agent market if the Angels fail to make the postseason in the next two seasons. "I don't know the answer," a rather diplomatic-sounding Trout said. "I want to get to the playoffs. That's my mindset. I can't predict the future. So I just take it one game at a time now and see what happens." "He has never said that (he won't re-sign if we don't make the playoffs)," Eppler said. Angels owner Arte Moreno said during Spring Training the situation is constantly on the minds of the franchise. "Let's put it this way: It's always in our minds, we're always thinking about it," Moreno said. "If you look at long-term plans, you're always trying to position yourself for something like that. But we have three years. We try not to do anything in an urgent way. We don't think that's a good way of doing business." Trout, 26, is leading the Majors in wins above replacement (and on pace to possibly break the MLB single-season record for WAR). He is tied for second in MLB in home runs, tied for first in runs and alone in first with 53 walks. And he is 13-for-13 in stolen base attempts, the most of any player in the majors yet to be caught stealing.